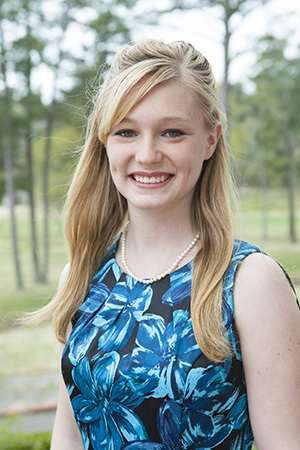 Samford University history and French double-major Becca Wilcox of Chesterfield, Mo., has been chosen to participate in the new South China Internship (SCI) project organized by the Hong Kong America Center (HKAC) and United International College (UIC) of Zhuhai in China’s Guangdong province. The SCI project is funded in part by a grant from the Ford Foundation to the U.S. “100,000 Strong Initiative,” which seeks to increase opportunities for Americans to live, study and learn in China. Wilcox is one of only 20 Americans chosen to partner with 20 Chinese students for the eight-week summer internships supervised by major corporations based in South China. She will arrive in Hong Kong in early June this year—only weeks after her graduation from Samford–and work through early August. Wilcox said she will be working with New Pathway Education & Technology Group, a Shanghai college consulting firm that helps Chinese students prepare for higher education experiences abroad. At the end of the internship, Wilcox and her Chinese partner will present to the whole group a summary of the projects they undertook for their host company. “When the Hong Kong-America Center first announced this project that would involve only 20 American students, I knew we could be competitive with the right student,” said Rosemary Fisk, professor of English and associate dean of Howard College of Arts and Sciences. Fisk, who was a Fulbright Scholar in Hong Kong in 2011, asked history professor Paul Cha to recommend a student. Cha, coordinator of Samford’s new global studies major, immediately thought of Wilcox even though she is neither a global studies major nor an Asian history minor. “I’m just so impressed with Becca as a student,” Cha said. He noted that Wilcox was in competition with Asian studies majors from throughout the nation, but her passion for learning about the region, her academic record and her confidence in the face of a daunting international opportunity successfully carried her through the application process. When Cha mentioned the internship to Wilcox she thought it was out of the question, financially. “There’s no way,” she thought after seeing the price of airline tickets and various other expenses. “I can’t afford that.” But Fisk and Cha not only helped her navigate the application process, they also secured funding from the history department and from the office of Howard College of Arts and Sciences dean David Chapman. “They’ve made this 100 percent possible for me,” Wilcox said. Host corporations will provide for the students when they begin work. Wilcox said her interest in Asia began with her parents’ adoption of a Chinese girl when Wilcox was in the 7th grade. Wilcox hoped to accompany her parents to China to help bring home her new sister, but the adoption was approved so quickly that her own visa didn’t arrive in time. She is happy to have a second chance now that she has immersed herself in Asian literature and Samford’s Asian history courses. “I’ve been wanting to go to China for over 10 years now,” Wilcox said. If all goes as she hopes, Wilcox will trade south China for France’s Loire Valley this fall. She has been offered an English language teaching internship in the Orléans-Tours school district. She has no specific plans beyond that work, but said her dream job would be working with a foreign embassy in the U.S. or with the U.S. State Department.